We are excited for Rev. Courtney Finocchiaro Stamey, her husband, Rev. 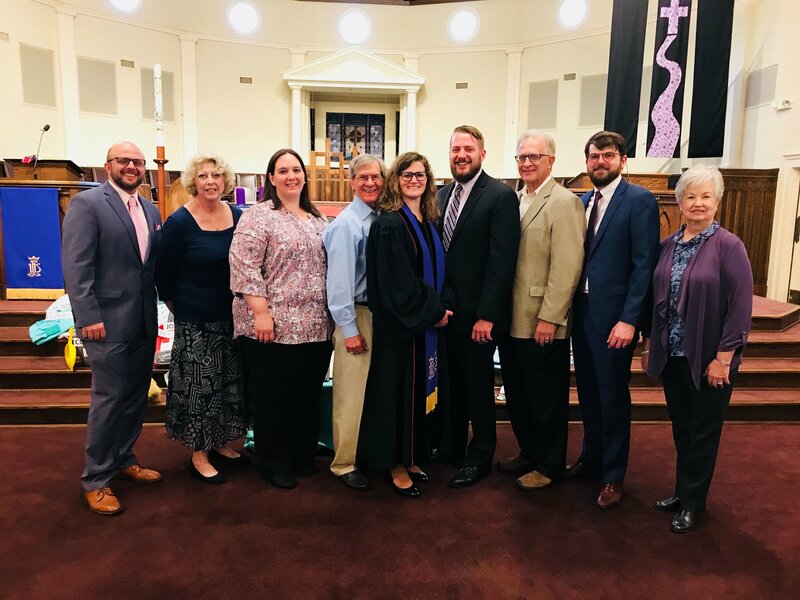 Michael Stamey, and the Congregation of Northside Baptist Church as Sunday, March 18 Courtney was called as the church's Senior Pastor. Please see below a letter from Michael and Courtney. Courtney leading worship at Northside Baptist Church in Clinton, Mississippi. This weekend, Courtney and I traveled to Mississippi as part of the next stage of a call process. On Sunday, March 18, Courtney was voted in as Senior Pastor of Northside Baptist Church in Clinton, Mississippi. I am also in an active search process with a nearby congregation. Northside has called Courtney for some of the same gifts you saw in her during the ordination process- her relational nature, preaching, and commitment to the Gospel believing that all belong at God’s table. Last Wednesday, I informed our students about this exciting opportunity. We wanted the youth to be informed of our process, and hear it from us. They have been supportive, and we are encouraging them to express their emotions in entirety. Courtney and I truly do believe that God is calling us, and although it isn’t easy, we do believe it is what is next. This is one of the more difficult decisions that we have ever had to make. The relationships I have with my students is the most satisfying part of my ministry and the central evidence of my calling. As you may be aware, Courtney’s tenure at FBC Greensboro was a stepping stone. 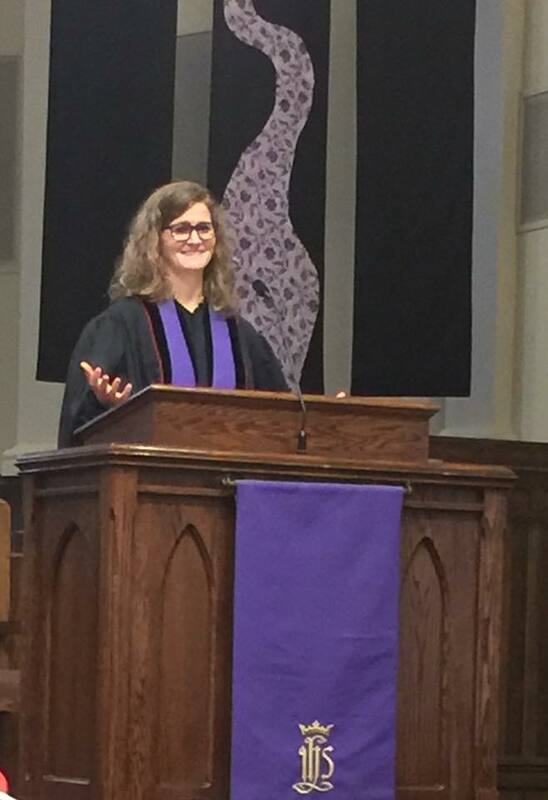 As a pastoral resident, she accepted the position knowing that its purpose was to prepare individuals for the ministry by equipping recent seminary graduates with the knowledge and the skills they would need to flourish. She has continued to discern her calling to be a pastor during this time. Courtney has had many exciting opportunities that arose during her search and we have most certainly felt the Holy Spirit move within this process in particular. More than anything we ask for your prayers. You all have been with us through the ups and downs of the last five years. You have been with us at the beginning of our marriage, our ordinations, three moves, mission trips, and even when our apartment flooded. You are the people who called out these gifts in us and have transformed us into the confident ministers we are today. More than anything, you have taught us that a church is a place where people can feel wholly needed, welcomed, and loved. Courtney (center) and her husband Michael (right of center), along with the pastor search committee of Northside Baptist Church after worship on affirmative Sunday. We confess as scripture teaches, “Together we are one body, and individually members of it.” We feel like we have become family to one another, and that is what makes preparing to say goodbye so difficult. Truthfully, we need you in this process, to walk alongside us and our youth in particular. At this time we do not anticipate an immediate departure and look forward to investing our time in leaving well and celebrating our relationships with the congregation. We will continue to keep you informed of our process and are open to questions as they arise. Courtney and I will always cherish the relationships that have been formed and strengthened during our time at First Baptist Church High Point. We are who we are, because of who you are. You can learn more about Courtney's calling to Northside Baptist Church in Clinton, Mississippi and more about the congregation by visiting their website at http://www.northsidebaptistms.org/.